In a newly published study, MIT researchers detail the technique they used to develop a photovoltaic device that generates more than one electron per photon, boosting efficiency. Now, researchers at MIT have shown that there is a way to blow past that limit as easily as today’s jet fighters zoom through the sound barrier — which was also once seen as an ultimate limit. Their work appears this week in a report in the journal Science, co-authored by graduate students including Daniel Congreve, Nicholas Thompson, Eric Hontz and Shane Yost, alumna Jiye Lee ’12, and professors Marc Baldo and Troy Van Voorhis. In a standard photovoltaic (PV) cell, each photon knocks loose exactly one electron inside the PV material. That loose electron then can be harnessed through wires to provide an electrical current. But in the new technique, each photon can instead knock two electrons loose. This makes the process much more efficient: In a standard cell, any excess energy carried by a photon is wasted as heat, whereas in the new system the extra energy goes into producing two electrons instead of one. While others have previously “split” a photon’s energy, they have done so using ultraviolet light, a relatively minor component of sunlight at Earth’s surface. The new work represents the first time this feat has been accomplished with visible light, laying a pathway for practical applications in solar PV panels. This was accomplished using an organic compound called pentacene in an organic solar cell. While that material’s ability to produce two excitons from one photon had been known, nobody had previously been able to incorporate it within a PV device that generated more than one electron per photon. Since this was just a first proof of principle, the team has not yet optimized the energy-conversion efficiency of the system, which remains less than 2 percent. But ratcheting up that efficiency through further optimization should be a straightforward process, the researchers say. “There appears to be no fundamental barrier,” Thompson says. Solar panel efficiencies can also be improved by stacking different solar cells together, but combining solar cells is expensive with conventional solar-cell materials. 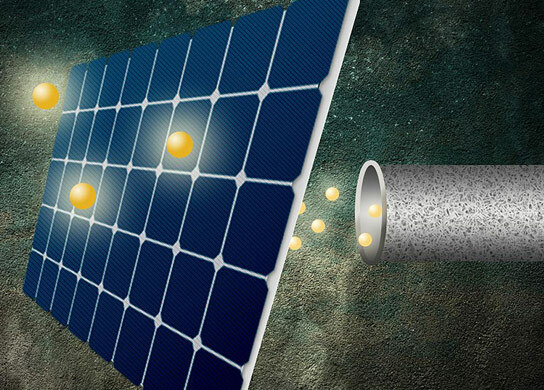 The new technology instead promises to work as an inexpensive coating on solar cells. The work made use of a known material, but the team is now exploring new materials that might perform the same trick even better. “The field is working on materials that were chanced upon,” Baldo says — but now that the principles are better understood, researchers can begin exploring possible alternatives in a more systematic way. The research was performed in the Center for Excitonics and supported by the U.S. Department of Energy. MIT has filed for a provisional patent on the technology. 4 Comments on "New Technique Yields a Major Boost in Solar-Cell Efficiency"
It occurs to me that if two electrons are better than one, (this is a public disclosure) what if you arranged a semiconductor sandwich structure and created a cascade of photons, gradually absorbing the energy of the incident photons and ejecting an electron with each step. Very exciting news about boosting energy output of PV solar cells. Lately there have been other advances using different techniques such as graphene, black silicon, infrared absorbing polymer, nanomesh, textured surfaces, iron oxide, photochemical upconversion and others. I wonder how the combination of 2 or more would boost energy output, efficiency and cost-effectiveness of PV panels. Naturally, some combinations cancel each other out, but some can work synergistically, while hopefully keeping costs down. Not long ago, I was delightfully proven wrong about the lifetime output of PV cells vs. the total amount of energy spent in manufacturing them. That PV panels panels pay for themselves in 10 years of use. I was happy to know that people were farsighted enough to prove the value of investing resources into a technology that has now proven its value over time, and will continue to increase in ROI as new advances keep on improving the technology. Stephen raises a very interesting point. The key issue is modeling increase in efficiency against increase in unit cost (or price, depending whether we look at it from the manufacturer’s perspective or the customer’s). Many panels are guaranteed to operate at a minimum of 80% of factory rating for up to 25 years.